The NANOGrav (North American Nanohertz Observatory for Gravitational Waves) Physics Frontiers Center is a collaboration of scientists working to detect and study very low frequency (about nanohertz) gravitational waves. Using an array of high-precision millisecond pulsars, we seek to measure the influence of gravitational waves on the Earth. 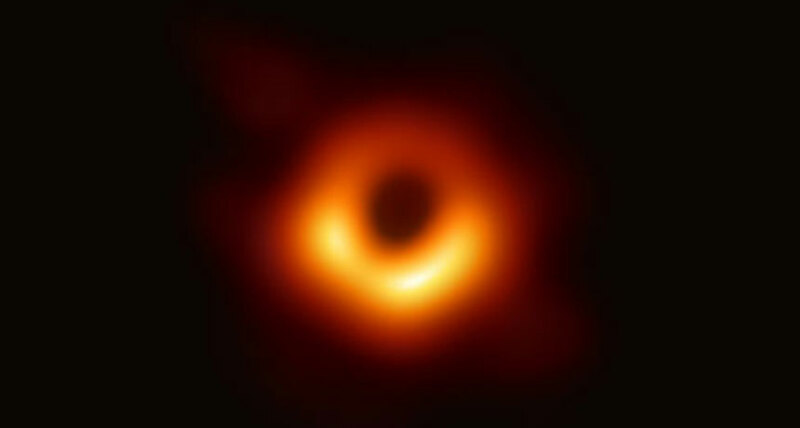 At these frequencies, we expect to detect a stochastic background of merging supermassive black holes, individual inspiral and merger events, and possibly cosmic strings and inflationary gravitational waves. NANOGrav consists of astrophysicists at over a dozen institutions throughout the United States and Canada. We count among our ranks senior faculty and researchers, postdoctoral scholars, graduate and undergraduate students, and even high school students through our educational and outreach partnerships. There are several ways to get involved in NANOGrav. We invite any interested scientists and students to give a talk at one of our monthly science seminars, and we welcome collaboration with scientists in fields relevant to NANOGrav. Interested scientists should consult the NANOGrav Membership Policy and Bylaws for more information. Millisecond pulsars rotate with incredible stability, allowing them to be used as precise clocks. The time of arrival (TOA) of a pulse can usually be measured to δ/(S/N), where δ is the pulse width (typically a few hundred microseconds) and S/N is the signal-to-noise. For many millisecond pulsars, this results in TOAs measured with ≲ few μs precision. TOAs are used to construct a timing model that is coherent in pulse phase, i.e. it accounts for every single rotation of the pulsar by modeling the rotational, astrometric, and (when applicable) binary parameters of the system. The residuals in these timing models (the difference between the predicted and measured TOAs) can have an RMS scatter as little as 100 nanoseconds over timescales of many years. 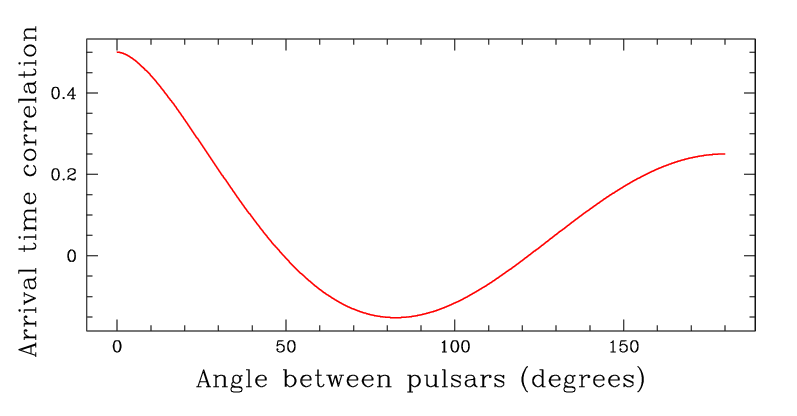 The Hellings-Downs curve, which shows the expected angular correlation in pulsar timing residuals due to gravitational waves. 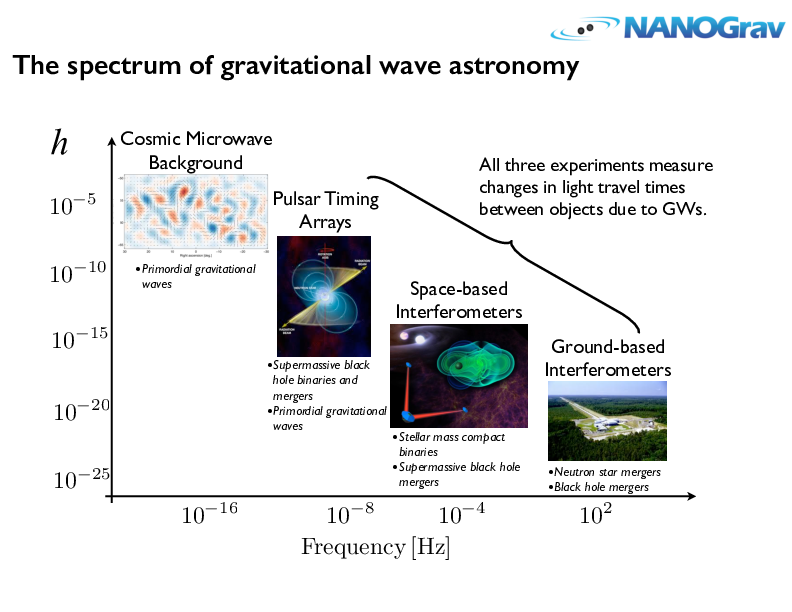 NANOGrav seeks to detect and study gravitational waves by looking for their influence in timing residuals from an array of ultra-precise millisecond pulsars. Gravitational waves passing through the Solar system will lead to correlations in the timing residuals between pairs of pulsars, even though the influence on the pulsars themselves will not be correlated across the array. This "Earth term" depends only on the baseline between pulsar pairs and is given by the Hellings-Downs curve. We are sensitive to gravitational waves with periods between the cadence of pulsar timing observations (weeks) to the span of our dataset (years), which corresponds to nanohertz frequencies. This allows NANOGrav to probe a unique phase space that is complementary to interferometric gravitational wave detectors. The sensitive of our array increases as we add more pulsars, improve TOA precision and the RMS of our timing residuals (which depend on instrumentation and our understanding of the pulsars and propagation effects through the interstellar medium), and time. The latter factor is thanks to the expected nature of the gravitational wave spectrum, which increases in amplitude as we move to lower frequencies. NANOGrav will also be able to explore large portions of parameter space for cosmic strings. These topological defects are predicted by a large class of cosmological models, from symmetry breaking models to string-theory-inspired models. NANOGrav will either confirm their existence or place severe limits on properties such as the energy scale at which they form. 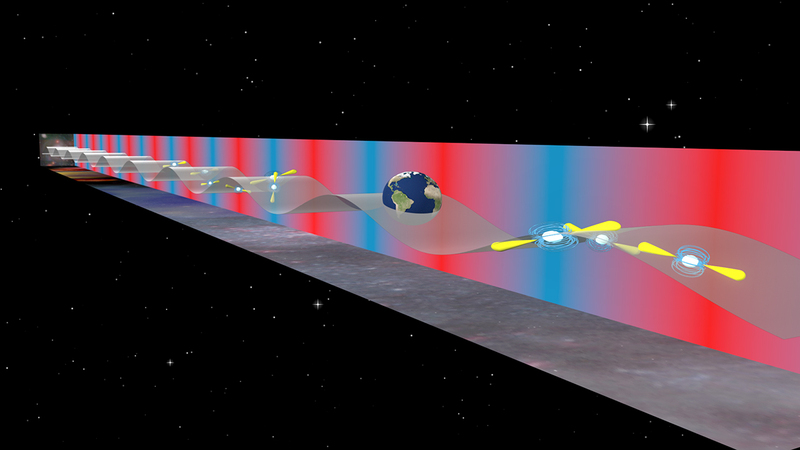 A cosmic string detection would reveal information about high energy physics unattainable via accelerator experiments. NANOGrav uses high-precision millisecond pulsars as gravitational wave detectors, observing over two dozen sources at regular intervals. This produces valuable secondary science including a greater understanding of the dynamic interstellar medium, the stability of millisecond pulsar rotation and emission mechanisms, the discovery of new pulsars, and a detailed characterization of individual binary pulsar systems. The latter may include precise neutron star mass measurements that constrain the equation of state of ultra-dense matter and allow us to study general relativity in ever more diverse and extreme environments. Our data set can also be used as an independent check of Solar System ephemerides and universal time standards. NANOGrav uses millisecond pulsars as clocks whose signals respond to the minuscule changes in space-time caused by gravitational waves. This deviation is expected to be less than ~100 nanoseconds, which drives our technical requirements—radio telescopes and backends capable of determining pulse times of arrival to nanosecond precision for an array of dozens of high-precision millisecond pulsars distributed across the sky. NANOGrav's key instruments are the William E. Gordon Telescope at the Arecibo Observatory and the Robert C. Byrd Green Bank Telescope. Both telescopes are absolutely vital; Arecibo because of its unparalleled sensitivity and the GBT because of its own excellent sensitivity and ability to observe over 85% of the sky. 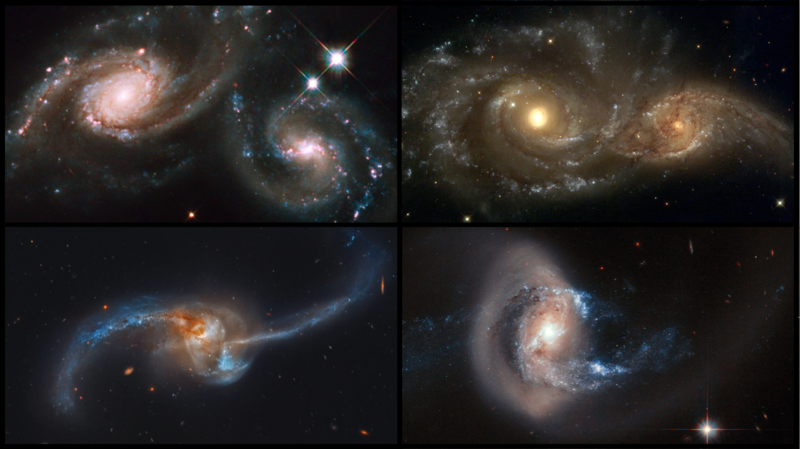 NANOGrav members have equipped both telescopes with state-of-the-art GPU-based backends. We currently observe 36 pulsars every two weeks at both telescopes and cooperate closely with two large area pulsar surveys, the PALFA survey at Arecibo and the GBNCC survey at the GBT. The NSF divestment from the GBT is a serious threat to our science goals because there is no other North American telescope that can replace it. NANOGrav is working with our partners to secure the future of the GBT. We invite you to read our response to the NSF portfolio review. NANOGrav congratulates our LIGO colleagues and their collaborators across the electromagnetic spectrum on another milestone of modern astronomy: the first detection of a merger of two neutron stars. This first detection of an object in both light and gravitational waves is a remarkable feat and demonstrates the unique power of uniting these two methods to explore our Universe. This Special Session will highlight advancements in astrophysics in the low frequency gravitational waveband and will feature a mix of invited and contributed oral presentations and posters. NANOGrav congratulates our LIGO colleagues on their discovery of gravitational waves from a binary black hole system. This result is a major milestone, not only in the field of gravitational-wave astronomy, but in the history of science!